By Jim Dower: In a real surprise, middleweight contender Tureano Johnson (20-2-1, 14 KOs) fought to an eight round draw against journeyman Fernando Castaneda (26-13, 17 KOs) on Saturday night on DAZN at the Fantasy Springs Casino, in Indio, California. Johnson, 34, was hurt in the last 20 seconds of the eighth round by a flurry of shots from the motivated Castaneda, but he was able to make it out of the round. Johnson was hurt in a number of rounds by Castaneda. Johnson was struggling with his combination and energy. The two of them were firing uppercuts one after another. These devastating shots with both guys having their heads snapped back. The judges scored it 77-75 for Castaneda, 77-75 for Johnson, and 76-76. Boxing News 24 scored it for Castaneda. This was not the performance that many boxing fans expected from the talented 2008 Olympian Tureano, who is a fighter that is highly rated. Johnson was supposed to easily win this fight over Castaneda. It wasn’t supposed to be a competitive match-up, but the crowd had Castaneda motivated, as well as knowing that the fight was being streamed on DAZN. 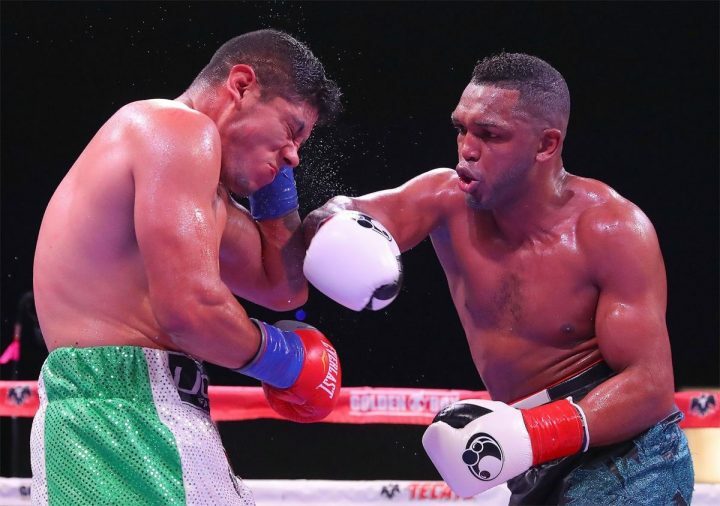 You can argue that Castaneda was a lot more motivated in this fight than he was in his previous losses to Demond Nicholson, Sean Monaghan, Hosea Burton, Frank Buglioni, Silverio Ortiz, Tewa Kiram, Johan Perez, Janer Gonzalez and Taronze Washington. Had those guys been inside the ring with Tureano tonight, they all likely would have been knocked out or beaten by a decision. Tureano was landing huge uppercuts that would have knocked out most fighters, but Castaneda took the punches and fought back with his own punches. “Tureano Johnson wasn’t at his best,” Johnson said after the fight. “I tried to please people. Castaneda did an awesome job. It’s been a year since I’ve been in the ring. It wasn’t an overlook. We came and prepared. I didn’t execute the way I should have. I wasn’t listening to my coach. Tureano will be back on television to show the world he has great talent,” Johnson said. It’s doubtful there will be a rematch. Johnson doesn’t need any more of the fire that Castaneda will bring to him. Johnson needs to start listening to his trainer, because he was tuning him out the entire fight, and just mindlessly brawling. Johnson came into this fight having been out of the ring for 18 month since his 12th round knockout loss to Sergiy Derevyanchenko in August 2017.